Ally is a Canadian SSB4 Mario player from Montreal, Quebec, who also occasionally resides in Flint, Michigan. He is considered one of the best Smash 4 players in the world, the best Smash 4 Mario player of all time and one of the current two best ones in the world (along with ANTi), and the best Marth player in both Canada and Michigan. His crowning achievement was winning EVO 2016, the largest Smash 4 tournament to date. Ally is formerly ranked 2nd on the Michigan Smash 4 Power Rankings Season 13 and currently 3rd on the Canada Smash Ranking, 1st on both the Montreal and Midwest Smash 4 Power Rankings, and 5th on the Panda Global Rankings 100. In SSBB, he is a Snake main, and was considered the best Snake player in the world when he was fully active, as well as one of the best Meta Knight players in North America. He is currently ranked 14th on the 2016-2017 SSBBRank, was ranked at the 0 position on the final Quebec Brawl Power Rankings, and 1st on the final Michigan Brawl Power Rankings. He is considered one of the best Brawl players in the world. In PM, Ally is an Ike player, and is considered one of the best Ike players in the world, alongside Envy. Ally was formerly ranked 37th on the PMRank 2016. Ally is the sixth player to take a set off of ZeRo in Smash 4, and the second to eliminate him, doing so at Get On My Level 2016. In addition, he is the first player to eliminate him at multiple tournaments, achieving this again at Smash 'N' Splash 2, Super Smash Con 2016, and GENESIS 4. Since the onset of Smash 4's final balance patch, 1.1.6, Ally has maintained a positive record on ZeRo, 8-7; his eight wins are the most of any player in Smash 4 history. On August 18th, 2016, Ally was signed by Cloud9. Over a year later, on April 3rd, 2018, Ally and Cloud9 parted ways. With Snake returning in Ultimate, he picked up his Brawl main again. The editor who added this tag believes this page should be cleaned up for the following reason: This "tournament history" looks more like a real-time report on his wins/losses. It should be a summary instead. Ally first gained prominence at his first United States tournament, Cataclysm 4, placing 3rd, losing to Mew2King and Azen. He later attended Clash of the Titans IV, placing 2nd, being double eliminated by Mew2King. Ally would win Apex 2009, defeating Mew2King. Just two months later, at GENESIS, Ally repeat his performance, and took 1st again, double eliminating Mew2King. At EVO 2009, Ally placed 2nd, falling to mikeHAZE and Mew2King. Shortly afterwards, Ally also placed 2nd at S.N.E.S., being double eliminated by ADHD. At Pound 4, Ally placed 3rd. Defeated by Ksizzle, he proceeded to make a lengthy Losers' run, defeating Seibrik, Havok, Shadow, and Ksizzle, before losing to Mew2King. In contrast, Ally defeated Mew2King at WHOBO 2, and placed 1st. Despite his prior win on Mew2King, Ally placed 2nd at both MLG Orlando 2010 and MLG Columbus 2010, losing to Mew2King both times. Ally then notably attended European tournament Bushido Brawl Impact, placing 2nd. He defeated Kaos and Glutonny, but would ultimately be double eliminated by Glutonny. Returning to North America, at Apex 2010, Ally would place 5th, losing to Brood, then defeating Anti and RAIN before being eliminated by Mew2King. He was eliminated early at MLG Raleigh 2010, by Havok, placing 17th. Ally placed 8th at MLG DC 2010, falling to ESAM. In November of 2010, at MLG Dallas 2010, the final tournament of the MLG 2010 circuit, Ally placed 4th, being eliminated by Tyrant. At Pound V, Ally took 1st. Following a loss to ESAM, Mew2King would forfeit to him in Losers', and he proceeded to defeat Gnes, ADHD, ESAM, Seibrik, and double eliminate ANTi. He then proceeded to win WHOBO 3, defeating Dojo and UltimateRazer. At GENESIS 2, Ally placed 2nd, initially losing to ADHD, before beating Zex, Gnes, and ADHD, before falling to Mew2King. At the first tournament of the new year, Apex 2012, currently the largest SSBB tournament of all time, Ally placed 5th. He defeated Brood and UltimateRazer, before losing to Otori and Nietono. Ally repeated his 5th place placement at SKTAR, defeating DKwill, Dabuz, and Mr. R, before losing to ESAM and Vinnie. He would be unable win his third WHOBO tournament, placing 2nd at WHOBO 4. After barely losing to Atomsk early in winners' bracket, he then eliminated Seibrik, Nick Riddle, DKwill, Atomsk, Gnes before falling to ESAM. Following that, Ally attended Apex 2013, placing 13th. He fell to Mikeneko early, defeated Pwii, then lost to Dabuz. He would later win IMPULSE 2013, defeating Dabuz. Then, he'd place 9th at SKTAR 2, upset by MVD, and defeated by ESAM. In 2013, Ally began playing Project M entering Singles at KTAR 8, placing 2nd, defeating Rolex before falling to Mew2King. In Brawl Singles, he placed 4th, defeating Nairo, before losing to Mew2King. He then eliminated Mr.R before losing to Nakat. At Apex 2014, Ally placed 5th in Brawl Singles. He lost to ZeRo, and then eliminated Seagull Joe and Tyrant, before being eliminated himself by Mew2King. In PM Singles, he placed 7th, losing to Sethlon. In Brawl Singles at SKTAR 3, Ally placed 5th, defeating Nairo, before once again losing to ESAM. He was then eliminated by ZeRo 0-2 in losers' quarters. Ally traveled to Mexico to attend Smash Factor 3. Not much is known aside that he placed 3rd in Project M singles, losing to MkLeo 2-3 in losers finals. Ally's first recorded SSB4 tournament was Smash Intensifies, which he won, defeating Chrim Foish, HolyNightmare, and Chrim Foish again. In December of 2014, Ally won The Come Up, the Canadian qualifier for Apex 2015, without dropping a single set, defeating Mew2King, Nakat, and DKwill. He was later invited to the CLASH Online Invitational Finals, where he placed 7th, losing to Zucco and ANTi. At the The Flex Zone he defeated Frozen and False in winners before losing to Dabuz in winners finals. In losers finals he defeated False again and then defeated Dabuz in 2 sets of grand finals. 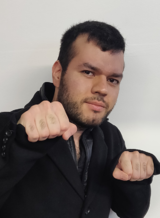 At Neo Canadia 5 he defeated Jerm, V115, Poke, and Meekspeedy before barely losing to NAKAT in winners finals. In losers he defeated Chrim Foish and NAKAT twice to win the tournament. At Apex 2015 he lost to Vinnie in pools. In losers he defeated Plup, Zinoto, and Vinnie in a rematch before falling to Nietono and aMSa. In March 2015, Ally won Shots Fired, a national tournament held in Easton, Pennsylvania. Ally lost to 6WX in winners semis, but made it to grand finals on losers side after defeating Max Ketchum, Mew2King and 6WX in losers finals. In grand finals, Ally took down Nairo twice and won. He switched to Diddy Kong frequently in this tournament. At LAN WAR X Ally was upset by Red X in winners. In losers bracket he defeated K.I.D. Goggles, Chrim Foish 2-0, Meekspeedy, Red X in a rematch and HolyNightmare twice to win the entire tournament. At Enthusiast Gaming Live he took 2nd place after defeating Blacktwins and Meekspeedy, he lost to Holy twice in grand finals. At Shuffle VII Ally defeated Mister Eric, LOE1 and Zinoto to make grand finals winners side. In grand finals he lost the first set to Zinoto but won the second set to take home 1st place. At Smash 'N' Splash Ally defeated NiTe and Logic before being upset by Wizzrobe in winners semis. In losers he defeated Mister Eric, Shel, Wizzrobe, and ScAtt twice to win the tournament. At EXP 2015 Ally defeated Astro, and Poke to make it to winners finals. He was then defeated by V115 and Poke in a rematch and placed 3rd. At EVO 2015, Ally placed 5th, after beating StaticManny to advance to Top 8 on the losers side, then defeating ESAM but lost to Mr. R. At Low Tier City 3 Ally defeated Dakpo, Kamicario and Denti before being sent to losers by ZeRo in winners finals. In losers he defeated Zenyou before being eliminated by ZeRo again. At Summit 2015 he defeated Trulliam, Iceninja, SpaceDong, Poke and Holy to take 1st place. At the California national Paragon Los Angeles 2015 Ally defeated Jonny Westside before being sent to losers by Shaky. In losers he defeated Pink Fresh, Z, Dakpo, Zex, Larry Lurr, 6WX and Mr. R before losing to Dabuz and finishing in 4th place. Ally then traveled to Japan for Umebura F.A.T. where he placed 7th after beating Gomamugitya, Umeki, and Nyanko before being eliminated by 9B. In October, he attended Smashfield weeklies #9 as a pre The Big House 5 touranment. At the weekly he defeated Ksev, MVD, and MJG before losing to ESAM in winners finals. In losers he defeated Abadango and ESAM in both sets of grand finals to win the tournament. At The Big House 5 itself he defeated JJROCKETS to make it into Top 32. In Top 32 he lost to ANTi in winners eights and dropped to losers where he defeated Ryo before losing to ZeRo through the losers bracket to finish at 13th. 2 weeks later, at MLG World Finals 2015, he defeated Demitus to advance into the championship bracket winners side. In bracket he defeated False and Mr. R before lost to ZeRo again in winners semis. In losers he defeated TheReflexWonder before being eliminated by Nairo , placing 4th overall. To finish out the month he won Canada Cup 2015. Ally finished out 2015 with a solid win at Smash INTENSIFIES 2 with wins over Holy twice. To start out 2016 Ally attended Dismantle 2 where he defeated Ned before upsetted by DKwill. In losers bracket he defeated Zinoto , Vinnie and DKwil before being eliminated by Nairo and finishing 3rd. GENESIS 3 was 2016's first national. Ally made it to winners quarters in a dominant fashion, beating Xaltis, SlayerZ and Shaky. But then lost to Ranai and Nairo to finish at 9th place. At Frosty Faustings VIII Ally defeated Ned and JJROCKETS to make grand finals winners side. Even though JJROCKETS reset the bracket, Ally still won the tournament. In February, Ally won Oh, Did I Win? 2 by defeating LOE1, Zinoto and V115. Ally then went to Frostbite taking out JJROCKETS, Ksev, Ned and Zinoto. At Landlocked he was upsetted by Ryuga. In losers he lost to Dabuz ending at 4th place. To end out the month Ally went to Breakout 2 where he defeated Blacktwins and LOE1 before barely losing to Zinoto. In losers he eliminated SETHsational and reset the bracket against Zinoto but lost the second set. In March 2016, he attended the national tournament Shots Fired 2 where lost to ANTi and finishing in 9th place. He then attended Midwest Mayhem, a bracket reset by Mr. R in grands but Ally won the tournament in the second set. He would then enter OUTFOXX'D where he beat JJROCKETS and Zinoto before falling to Mr. R. In grand finals Ally was defeated by Mr. R and finished in second place. Ally would later travel to Virginia for Pound 2016 where in winners quarters he was sent to losers by VoiD. He was eliminated by Abadango in grand finals. At EGLX, he fell to Mew2King in winners semis. In losers quarters he defeated Mew2king in the runback. He placed 2nd at that tournament by losing to Nairo. At NEW FISH he defeated Dark Wizzy and Marss before falling to Larry Lurr. He was later eliminated by Larry Lurr. At Get On My Level 2016, Ally placed 1st; he also became the second person in Smash 4 history to eliminate ZeRo, defeating him 3-2 in grand finals. About a month later, he won Smash 'N' Splash 2, double-eliminating ZeRo in grand finals, making him the first player ever to eliminate ZeRo twice. These two wins began an extended period in which he was the only player who could consistently defeat the world's #1 player, and he became one of the closest challengers yet for the title of best in the world. His most illustrious tournament win came at EVO 2016, he defeated Kamemushi in grand finals and received the title EVO champion. At Clutch City Clash, he was double eliminated by Samsora and placing 3rd. Super Smash Con 2016 was the summer's last major event. There, Ally losing to 6WX in pools. He made it to top 8 through the losers bracket by beating ZeRo again for the 4th time that year. He then beat Abadango but eventually lost to VoiD to finish at 5th. He later travelled to Rio de Janeiro to compete in the eGames Showcase 2016, where he rampaged through the winners bracket uncontested, beating Wabz, Larry Lurr and MKLeo without dropping a game. In grand finals he faced off again against Larry Lurr and narrowly avoided the bracket reset, barely beating him. On August 18th, 2016, Ally was signed on by Cloud 9 as their second Smash player after Mang0. At The Big House 6, he was upsetted in pools by WaDi. He beat Pink Fresh but then felt ill and decided to drop out from the tournament, ending his run at 25th place. At Canada Cup 2016, Ally's third encounter with MKLeo in tournament. They met in winners finals, where Ally had the upper hand, but in grand finals, Leo reset the bracket and won the event. At LAN WAR X 2016 Ally took the tournament beating Venom, Chrim Foish, and Venom in grand finals. At UGC Smash Open Ally lost to iStudying in pools, he later falling to Nairo and ending his run at 9th place. One week later at Showdown: Battle Royale Ally fell to Mr. R enroute to top 8. He was later eliminated by Mr. R again and finishing in 3rd. He ended 2016 with 2GGT: ZeRo Saga, he was falling to Larry Lurr and he was eliminated by MKLeo finishing at 5th place. At Midwest Mayhem 6: SoCal Invasion, Ally was defeated by Tyroy in winners bracket. Later, he was defeated by Shoyo James and finished at 7th place. At GENESIS 4, he narrowly defeating ZeRo with ZeRo using Cloud, he lost to MKLeo twice, placing 2nd. In February 2017 Ally attended Midwest Mayhem 7: Mexico Invasion where he falling to Tyroy in winners quarters. In losers he was being eliminated by Javi (Smash 4) and finishing in 5th place. Ally was then invited to Niconico Tokaigi 2017, where he defeated 9B before falling to Nairo and Dabuz. He ultimately finished 9th at the event. At Frostbite 2017, Ally was upset by Komota's Kirby in his pool, but still managed to qualify for top 48 losers. After beating Ranai, MVD, KEN, Kirihara and Kameme, he lost to Shuton at the beginning of losers top 8, placing 7th. In March of 2017, Ally would attend Super Smash Geek 6, the Midwest Mayhem 8: North American Tour qualifier. He placed 1st, defeating Holy and double eliminating Blacktwins. Travelling to Arizona, Ally attended Rise 2017, placing 1st, defeating Saiki, Luhtie, ANTi, and Elegant. It would serve as a precursor for the following weekend, when he attended 2GGC: Civil War. After defeating Vinnie to make it out of pools in top 96 winners, Ally lost to Locus. He then defeated Zenyou before losing to ESAM's Samus at the beginning of top 32 losers, placing 25th. In April, Ally first won Welcome to the Oven defeating Blacktwins in both winners and grand finals. At Midwest Mayhem 8, Ally solidly made top 8 winners after defeating Ksev, Shel, and JK. In top 8, he beat Locus but lost to Zinoto badly in winners finals. He was then eliminated by ZeRo in losers finals, placing 3rd. At DreamHack Austin 2017, Ally defeated everyone he faced in pools. Then in top 32 winners, he defeated Karna and Captain Zack each to make top 8 winners side. In top 8, he defeated ZeRo in winners semis but lost to MKLeo in winners finals. He then lost to ZeRo in a rematch in losers finals, placing 3rd. At 2GGC: Greninja Saga, Ally solidly won the event, defeating Tyrant, Edge, Komorikiri, falln, and Larry Lurr twice, qualifying for the 2GG Championship in December. At MomoCon 2017, Ally made it out of pools in top 48 winners side. After barely defeating Wrath though, he lost to Kameme in winners quarters. After qualifying for losers top 8 by defeating Komorikiri dominantly, he then lost to VoiD, placing 7th. At Smash 'N' Splash 3, Ally easily made top 8 winners, defeating Blacktwins and Mr.E. He then barely defeated Mr. R in winners semis and ZeRo solidly in winners finals. However, in grand finals, Ally lost to ZeRo twice, placing 2nd, which ended his streak of winning Smash 'N' Splash tournaments. At 2GGC: Nairo Saga, Ally made top 8 winners, defeating Twi , FOW, JK and Abadango barely. He lost to MKLeo badly in winners semis and Salem in losers quarters, placing 5th. Ally ended up getting ranked 5th on the PGR v3. At EVO 2017, Ally was upset by Chanshu and MVD, placing at a dissapointing 49th, his worst placing since CEO 2016 over a year prior and a far cry from his win last year. At DreamHack Atlanta 2017, Ally won in his pool and entered top 64 winners side. He immediately lost to VoiD. After defeating Sells, he lost to ZeRo again, placing 13th. Two weeks later, at Super Smash Con 2017, Ally was upset again, this time by 6WX and Darkshad in pools, placing 33rd. Ally would again place outside top 8 at 2GGC: SCR Saga, losing to MkLeo and CaptainZack, placing 9th. At Shine 2017, he lost to MkLeo in winners quarters (notably counterpicking Diddy Kong game 2), he entered top 8 losers side after barely defeating Mistake. He defeated Komorikiri solidly, but lost to Salem (again counterpicking Diddy Kong game 4) in losers quarters, placing 5th. Ally was invited to PAX Arena at PAX West 2017, where he defeated everyone in his round robin pool except ZeRo whom he lost to, to be seeded in winners quarters of the final bracket. After defeating ANTi solidly, he barely lost to Nairo and Salem, placing 4th. At GameTyrant Expo 2017, Ally was upset by Elegant in pools. He then lost to Larry Lurr badly in losers, placing 25th. Ally would later go on to The Big House 7 where he defeated Marss 2-0 in pools. In top 32, he narrowly lost to Mr.R putting him in where he defeated MattyG 3-0, Mr E 3-1, and komorikiri 3-2. In top 8, he had to play Marss again but lose 3-1 ending his run at 7th place. A month later, Ally attended Canada Cup 2017, Ally cruised through pools and top 32 in a dominant fashion where he didn't drop a game. In top 8 however, he lost to Larry Lurr and Lima 0-3 ending his run at 5th place. Ally's last tournament of the season was 2GG Championship where he defeated Tweek 3-0 and WaDi 3-1, but lost to VoiD allowing him to Qualify for the Playoff group. Although he managed to defeat Nairo 3-1, he lost to Salem 0-3, Dabuz 1-3, and Elegant 2-3 placing 9th. Due to his declining results, Ally was ranked 14th on the PGR V4 which was a far cry from his former seasons. The following year, Ally went to GENESIS 5 where he defeated BestNess and Darkshad 2-0 and 2-1 respectivly. In top 32, he beat Tamushika 3-1 but narroly lost to Salem and Falln placing 9th. Ally then traveled to Japan to attend Niconico Tokagi 2018 where he defeated shky but lost to Larry Lurr and MKLeo finishing at 9th place. At EGLX 2018, Ally solidly cruised through pools without dropping a game. And in top 32, he successfully defeated ANTi and upsetted Mr.R 3-1 allowing him to qualify for top 8 winners. However, he was defeated by Tweek 1-3 and Mistake 0-3 placing 5th. Ally later attended Smash Masters League: Battle for Vegas where he lost to Brosinex 0-2 in pools. He defeated Technicals 3-0 and Konga 3-2 before falling to Fatality 1-3 ending his run at 13th place. Ally underperformed at his next tournament Get On My Level 2018 as he failed to make it out of pools. He lost to Lima 0-3 and SDX 2-3 placing at a disappointing 25th place. His next national was Smash 'N' Splash 4 where he lost to BONK! early in pools. However, he made an impressive losers run defeating Chag 3-0, Gackt 3-1, CaptainZack 3-2, and Mistake 3-2 before narroly falling to Rags 2-3 ending his run at 13th place. At Hyrule Saga, Ally defeated CaptainZack 3-0 in pools before losing to Abadango and Tweek finishing at 17th place. Ally failed to achieve a single top 8 at a major event for the 5th season resulting in him getting 33rd on the PGR V5. Ally also stated that he didn't care that much about trying to get a high placing on the PGR due to the release of Smash Ultimate. Ally's first tournament for the final season was Showdown: Battle Royale 3, he cruised solidly through pools without dropping a game and defeated DarkShad 3-1, however he lost to CaptainZack 0-3. He managed to defeat Infinity in a close 3-2 set allowing him to qualify to top 8 losers. However he lost to Samsora 1-3 placing 7th. Ally would later go on to attend EVO 2018. In pools, he upsetted komorikiri 2-0 and defeated JK 2-1. In top 32 winners, he lost to Mistake 0-2. He then defeated Salem 2-1 in an extremly close set but lost to Elegant 0-2 ending his run at 13th place. Ally got his lowest placement yet at Super Smash Con 2018 where he lost to Ralphie 0-2 in pools. Due to a lack of motivation, he DQ'd after the loss placing 65th. Ally then had an awe-inspiring run at DreamHack Montreal 2018. He cruised through pools without dropping a game and only lost one game in top 32 to Mistake. Ally then defeated MVD in a dominant 3-0 fashion in winners semies. In winners finals, Ally lost to Larry Lurr in an extremely close 3-2 set. Ally then had to play MVD again in losers finals where he won 3-1. In Grand Finals, he lost to Larry Lurr 0-3 ending his incredible run at 2nd place. Ally's final Smash 4 tournament was Canada Cup 2018. After cruising through pools, he had two very close sets with ANTi and THUNDER. Although Ally managed to defeat the ladder, he lost to ANTi. He defeated Jayy in a dominant 3-0 allowing him to qualify to top 8 losers. Ally lost to Mr E's Lucina 1-3 ending his run at 7th place. Ally came into Super Smash Bros. Ultimate by returning to being a Snake main from Brawl. He won a weekly over Smokk, defeating his Ganondorf 3-1. Ally attended Super Splat Bros and made top 8 winners side after defeating Fatality in a close 3-2. He lost to VoiD 2-3 in winner semis but went through losers, defeating Xzax 3-0 and Trevonte 3-1 before losing to Larry Lurr 1-3, placing 3rd. C4 Galore! April 11th, 2009 1st 2nd Yes! Digital Ops Brawl August 1st, 2009 1st 3rd? ? Ally is Holy's younger brother, who he used to almost always team up with for doubles events. Ally and fellow Mario main ANTi are known for exaggerating Mario's weaknesses, which later became a meme on Twitter and in commentary. Due to his humorously inflammatory comments on social media, Ally is often considered one of the premier trolls of the Smash community, as evidenced by Coney dubbing him the "Twitter terror" at Pound 2016. At Smashachusetts II, Ally entered with the tag "Chileandude829" in homage of smasher Chillin, who was then known as "Chillindude829". In 2012, Ally temporarily went under the alias Axis, where he then announced his "retirement" from Smash and had "Axis" emerge shortly after, in a similar fashion to Mango's "Scorpion Master" alias when he mained Mario in Melee. Ally held the record for most Smashfield Weeklies tournaments won, having earned 1st place in 33 Smashfield Weeklies tournaments. Super Smash Con 2018 was Ally's worst placing at a Smash 4 tournament in his career, placing 65th, defeated by Ralphie before forfeiting in Losers. This is tied with his worst Project M placing, 65th at Paragon Los Angeles 2015. ↑ Cloud9 and Ally part ways. This page was last edited on April 14, 2019, at 21:37.